Colorado Basement Systems LLC recently completed a CleanSpace crawl space encapsulation system installation for a municipal project in Hayden, CO. The project consisted of a new station for the Hayden Police Department. Colorado Basement Systems was awarded the bid after the project's architect, Ron Szerlong Associates, PC from Steamboat Springs, specifically requested the CleanSpace liner used by Colorado Basement Systems. The 20 millimeter CleanSpace liner is thicker and more durable than standard liners and contains a safe, odorless antimicrobial additive, Ultrafresh, manufactured directly into it. 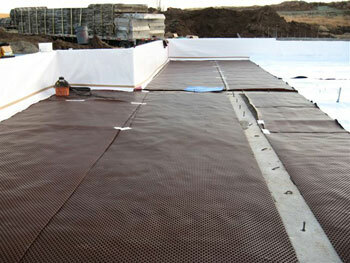 Dimpled polyethylene drainage matting was placed down first before the liner to create an air space and to make the installation more resistant to tearing. 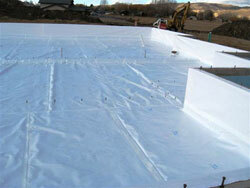 CleanSpace can be installed in new and existing construction, and even on concrete floors in crawl spaces. 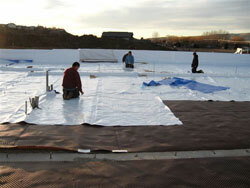 The 5,600 plus square feet installation was completed in two days and required five technicians.